Large swaths of the U.S. often suffer from all kinds of severe weather during the first quarter, impacting freight movements. This winter could be one of the coldest yet. It’s taking many people by surprise, though, because January started out with unseasonably warm weather in many parts of the country. Then temperatures suddenly plunged into the single digits and below in much of the Midwest, including sub-zero temps in Chicago and Minneapolis. The National Weather Service advises people to stay indoors, but if you must go out, “avoid taking deep breaths and minimize talking,” according to a report in USA Today. In any season, DAT load boards provide the largest and most trusted digital freight marketplace in the trucking industry, with more than 256 million loads and trucks posted annually, plus insights into current spot market and contract rates based on $60 billion in real transactions. Ice and precipitation slow down trucking operations, which has the effect of reducing capacity. Businesses may have trouble staffing at full levels as employees stay home or struggle to get to work. Consumers tend to stay home, cutting purchases at stores and restaurants. The impact on trucking operations can drive rates up, but slowdowns in business and consumer activity push rates down. So every winter event has a rate impact that can be plus or a minus depending on timing and severity. 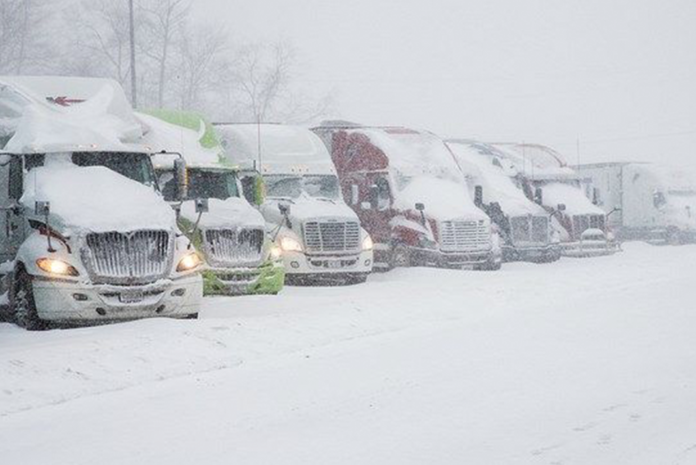 Extreme cold can put trucking operations at risk. Trucks may not be able to start, or they may not run reliably, fuel lines freeze and schedules slip. Cargo can also be damaged by the cold. If freight needs protection from freezing, the shipper may need to change routing instructions. If there are delays, or the truck is stranded on the highway, the cargo could be ruined. Most freezables, including water-based products, paints and chemicals, are fine as long as the truck is moving and the weather is just a little below freezing. But some commodities can’t be moved at all until temperatures are more moderate. When temperatures drop into single digits or below, all bets are off. Most LTL operations won’t pick up freezables, and shippers may be forced to ship products on temperature-controlled trailers that can provide heat. Good luck trying to find a reefer in Chicago this week, when the thermometer drops to minus-20. In some cases, insulated equipment and thermal blankets are enough protection on long hauls. During the “snowpocalypse” winter of 2014, a series of snowstorms extended across two-thirds of the continental U.S. Areas of the Midwest and Northeast were buried for weeks, and even the Southeast got hit with snow and ice, including places like Birmingham, Atlanta, Nashville and Charlotte. That caused prolonged disruptions in the supply chain that led to tight capacity and higher rates. This winter, we are facing the start of a new polar vortex event, as a cold air mass has been forced over much of the central U.S. CNN reports that “75% of the U.S. population will suffer below-freezing temps this week.” That means dangerous driving conditions. If you are driving, or dispatching drivers, into that mess, make sure to keep an emergency kit and plenty of warm clothing in the truck. Any and all of these factors have the potential to shift winter shipping patterns. Keep one eye on the Weather Channel and the other on DAT Hot Market Maps, to stay ahead of the news. Above all, keep warm and stay safe.